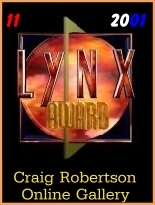 Craig Robertson Online Gallery - Awards. Awards won by this website. awards I received.Every award means a great deal to me and is proudly displayed in this page. You have been awarded the silver award! Our professional panel agrees that your site is everything you believe it is! 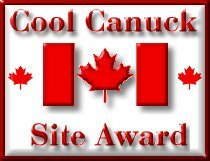 We are pleased to present you with a 2002 Canadian Web Award for providing a CANADIAN FRIENDLY, informative web site. Based on our review of your site we are presenting you with a VERY GOOD rating! Once again thank you and congratulations. 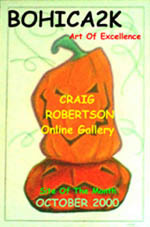 Craig Robertson Online Art Gallery has been reviewed and chosen to bear the 2002-2003 Golden Web Award. Congratulations for winning the Museumsaward. Your design is quite simple, but this is an excellent way to get the artists work into the foreground and this work is really marvellous. Also Your award presentation is really attractive. We are pleased to inform you that your site has won the Optical Resolution Graphics Excellence award. "A master of vision, Craig Robertson is multi-talented in a variety of media including portrait work, digital art and photography. You'll find his work a delight to the spirit with detail that will keep you interested. Robertson's composition is outstanding. We found his art a flight of fantasy that warmed our souls. It is with great pride we award Craig both our Gold award and our special award for Creativity not only due to the individual work he's done but as well due his is multiple talents! WOW!" I am pleased to write that your site, Craig Robertson online Gallery has earned the Pegasus "Creativity Award for Artistic Excellence"
Your site scored 95 out of 100 in meeting the selection criteria. I am pleased to advise you that your web site, Craig Robertson Online Art Gallery, has won the Best of the Web for MacOS Silver Award for Web Site Excellence. This is one of our highest honours for a Macintosh web site, and an Award that must be earned. Thanks you for submitting for the Best of the Web for MacOS Awards. It is only with the assistance of other Macintosh enthusiasts that we are able to bring sites like yours to the attention of others in the community. You have won the screaming-art silver award! Your web site, "Craig Robertson's Online Art Gallery," has qualified for the Beacon Award Gold. What strking and beautiful artwork! I was amazed at what I saw. In addition, your site is beautifully designed and easy to navigate. I will look forward to many future visits. Congratulations on an outstanding web site. I want to gratulate you of receiving Kjelles Award. I thought that your site was great. Keep up the great work. Take care ! Your site has been chosen as one of the monthly winners of The Lynx Award for November 2001. I enjoyed visiting your site and found it worthy of The Lynx Award. It is evident that you have put a lot of hard work in building your site. Again, Congratulations, you are in a select few to win this monthly award. I am pleased to inform you that your site has been approved for the EyeCatcher Respect Award. This Award is for pages with a special content and your site is a very informative page. Keep up your good work. 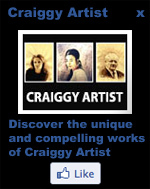 I enjoyed my visit to your site, Craig Robertson Online Art Gallery, so very much. Your pages are all wonderfully done with very interesting and creative content. I am very pleased to offer you my Kool Site Award. Congratulations on a wonderful site. I wish you continued success with this website and all future endeavors. Esoteric Links is pleased to annouce your site has been reviewed and you have won our Bronze Award. The sites are judged on content, functionality, graphics and usefulness to the general public. We spend a lot of time reviewing sites and not all make the grade. You have done a great job, keep up the good work! Congratulations on winning the Creation Association Bronze Award. Your site has good content and easy navigation. You have taken the time to create a site that has both an aesthetically pleasing look and valuable content with a specific purpose. All of us agreed that you truly do have a interesting web site with quality content and design. The Aloha Award is not an easy award to win. That is why this award is seen so infrequently. 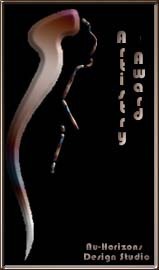 I am pleased to write that your site, Craig Robertson Online Gallery has earned the Visions of Adonai "Art 2001" Award. Your site scored 9.5 out of 10 in meeting the selection criteria. The layout, design and content of your site provide an aesthetic showcase for your wonderful art. Great use of code and tables. The colors throughout your site are appealing and complement your content. Navigation is good, graphics and titling are attractive. 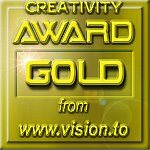 After reviewing your site, we'd like to present you with the following award: "Ever Eden Design Cool Site Award"
Thanks for applying for my Excellent Art Award. I have looked around your gallery and I like what I see. The graphic is easy and good looking, the navigation as well. And your art is exellent, different but very lovely and exciting. Full of wonderfull detals to look in to and imbibe. I think your gallery will enjoy many art lover on the net. I�am proud to give you my Award. Congratulations . It is with great respect and honour that we wish to give you our Art Award. Your works are extremely unique and conceptual. We wish you well in all your future endeavours. 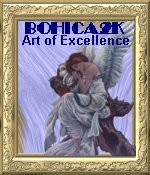 There are 6 judges here at the Bohica2k Award Headquarters, and it was unanimous...GIVE CRAIG AN AWARD! You have a great site with fantastic art! We found your site easy to navigate, and the art is mesmerizing. As I said in my review, I wish I could take photographs as well as you. Fate has brought us this very talented artist from Canada. Craig's site is simple...it's dedicated to his art. And fantastic art at that. You'll feel the love he has for his craft when viewing his tedious brushstrokes in the contemporary paintings collection. There isn't a color that Craig has left out. We counted! Our personal favorite--"Dancers"--had us mesmerized for a good long time. There are other collections of drawings, Digital Art, and breathtaking photographs. I can't take a photograph to save my life. Unless, of course, it's of my finger! Craig does photography justice. He also loves to create art (on wood yet!) and it shows. This is the kind of website that Bohica2k likes to visit. We hope you'll enjoy it almost as much as we did! Your Site is designed in the true nature of the Great Canadian Spirit! Artspace2000 is pleased to award you our 'World Web Award of Excellence' award for your website.Your site has been judgeded on its originality, overall design and appearance, its purpose, and ease of navigation.